kyaaaaaa~ OHKURA RABU! sankyuu saihara-sama, I am so flattered! yes yes yes! I believe he's a great kisser too!! <3 haha. I love your blending of the colours. <3 and I think your choice of Okura is good. (: Love love. I was just bemoaning the lack of K8 wallpapers to a friend yesterday! Thank you. I bet he is a great kisser too. That is so going to be my wallpaper now! I love the colors and blending. Thank you thank you! OMG GORGEOUS. *____* ♥ Not taking, but very, very pretty. omg! Tacchon! 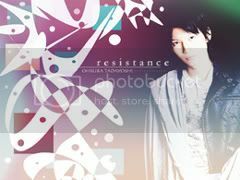 sekushii~ this wallpaper is really nice!